Deciding between steel or graphite shafts is mostly about feel. While it may seem that the head of a club is the key to an effective shot because of its direct impact with the ball, it's the shaft connected to the head that's considered "the most important component," according to PGA pro Mike Fischer. Graphite shafts are mostly used for drivers, but some golfers also use them for irons. Graphite is often used for driver shafts because it's lighter, according to PGA pro Mark Petrucci. Some players, according to PGA pro Mark Kramer, prefer this "softer feel." You feel the head's impact with the ball less intensely with graphite than with steel. Some players, however, such as pros Steve Stricker and Sergio Garcia, prefer the feel of steel shafts for their drivers. Whether you use steel or graphite is a matter of personal preference. Because graphite shafts are lighter, some of them come in a longer standard length than steel shafts to maintain the right balance, according to an article on the Golf Digest website. Kramer says longer graphite shafts might help you achieve more distance. Graphite shafts are also available in other lengths. In the book, "Materials and Science in Sports," the authors cite Golf Digest magazine tests demonstrating that a steel shaft has "better directional control" than graphite. Additional test cited by the authors demonstrated that graphite shafts have an advantage over steel regarding distance. Some players who are very strong and can handle the extra weight, however, may prefer steel over graphite because of possible improved accuracy, according to an article on the Golf Digest website. PGA pro Brad Smith, who is also a club maker, recommends graphite-shafted irons for golfers who swing the club slower or who are suffering from injuries. 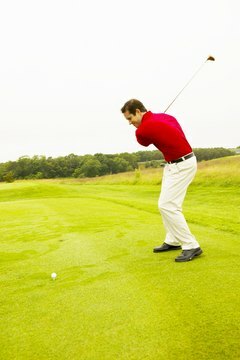 According to an article on the Golf Digest website, however, some tour players use graphite-shafted irons. The article notes that Juli Inkster prefers steel-shafted irons because of their consistency, while Paula Creamer has never used graphite-shafted irons. As with drivers, the kind of shaft that you use for your irons depends on your preference. Graphite shafts are more expensive than steel shafts, but if you want a more affordable set of clubs without the weight of regular steel shafts, Kramer notes, lightweight steel shafts are available. Lightweight steel shafts are also an option if you prefer a lighter weight club but don't like the feel or performance of graphite. "Ultra light steel (shafts)," Smith says, "increase your club head speed without giving up too much feel." Samantha Prust earned a BA in English from Minnesota State University and an MFA in creative writing from Colorado State University. She has more than 15 years of experience as a professional editor and writer in book, magazine, academic and online publishing. Prust is the author of "A Sentence a Day: Short, Playful Proofreading Exercises" and "Romance and Other Stories."